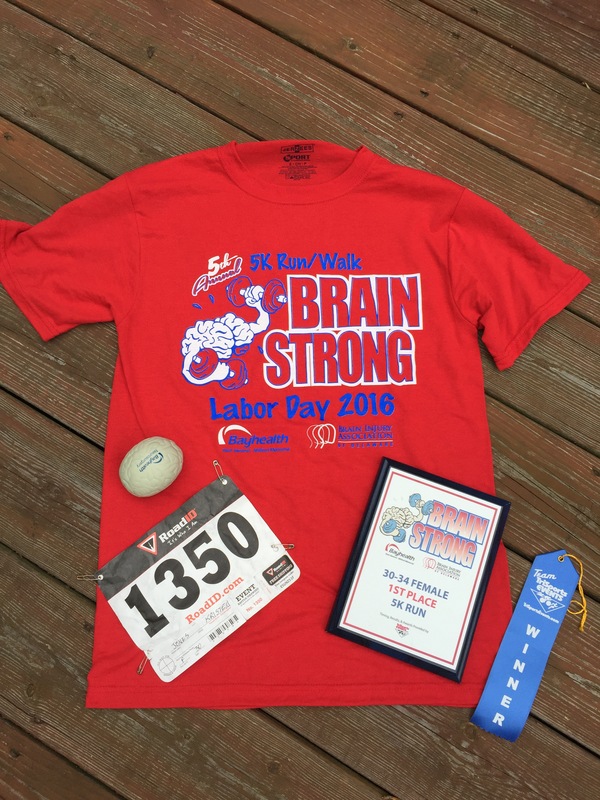 When I wrote my Labor Day weekend race roundup post I included this race, the BrainStrong 5k, but I didn’t know I would actually end up running in it. When typing up the details in my post I noticed it was taking place at a community that I often visit with my sister in Camden Wyoming. After a few exchanged text messages about our schedule, Courtney and I decided we would run it! This race benefits and raises awareness for brains injuries. It is in its 5th year and was very nicely organized! All the runners before the races! The race featured a 5k run/walk and a healthy kids kiddie k race. Shortly after arriving to the race our kids decided they wanted to do the kiddie k! The kids all lined up and ran toward where the actual race was starting! I was so excited to see the three kids all running and having so much fun! I tried to do a Facebook live feed of the kids racing but had no clue what I was doing and missed taking pictures or recording it- oh well! Jimmy was able to get these super cute videos of Grant! My kids were SO happy to receive finisher ribbons and I feel pretty confident all the kids will want to continue racing with us! 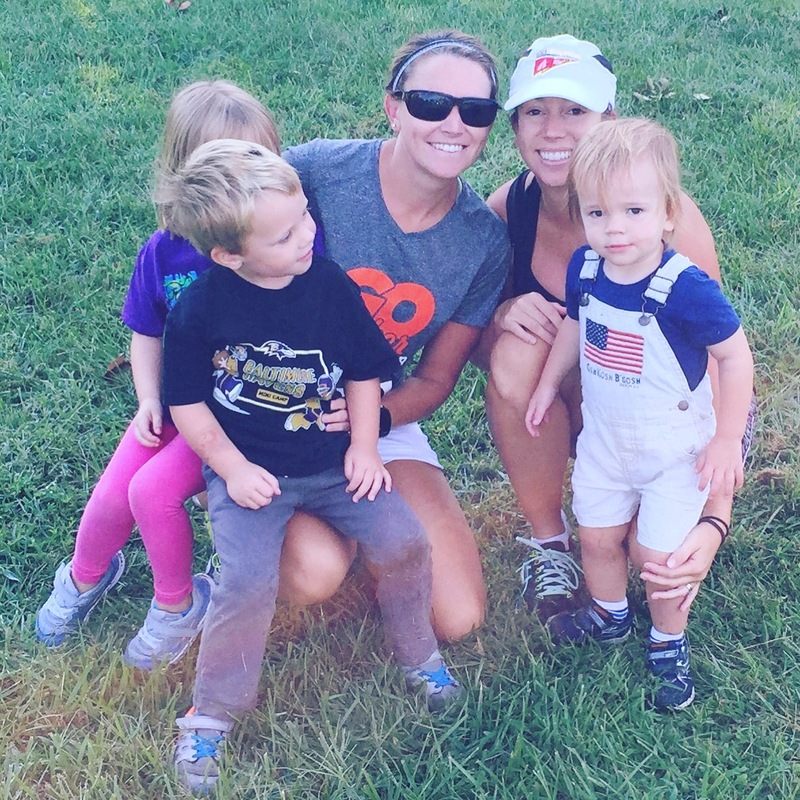 After the kids “raced” we got them settled and ready for our 5k. Courtney got Grant ready in his stroller and I helped get the kids situated with Chad who planned to spectate and visit the “childcare area” which did have people to watch your kids while you ran if you’d like. They had coloring sheets, blocks and other things to keep the kids occupied which was a really nice amenity! Not long after the race gun went off and the race started! The course was a simple out and back with a little circle at the turn around point through Wild Quail Community. I was happy to not have to be pushing any kids and hoped I’d be able to beat my Run, White and Blue time from Thursday night. The temperature was really nice and it was kind of cool- perfect running weather! Even though it was only a 5k the miles seemed to go by fairly slow! 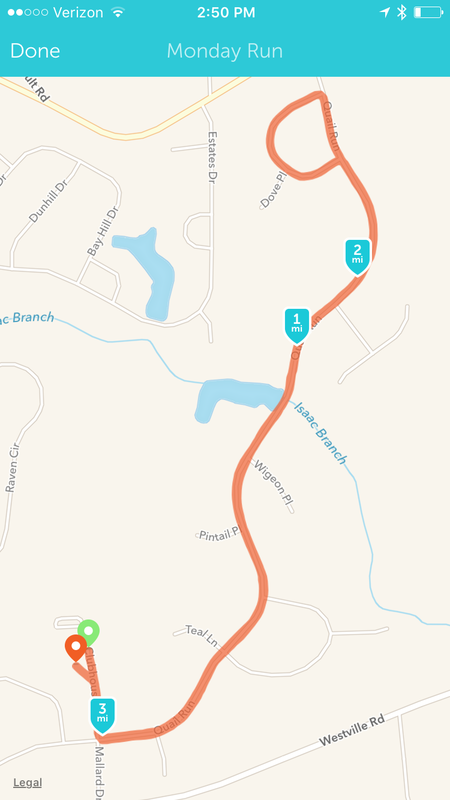 I felt like at times I was barely moving and I did stop to take some walk breaks throughout the run. Despite what seemed to be a kind of tough run for me I ended up finishing in 27:17, which was good enough to snag 1st place in my age group! 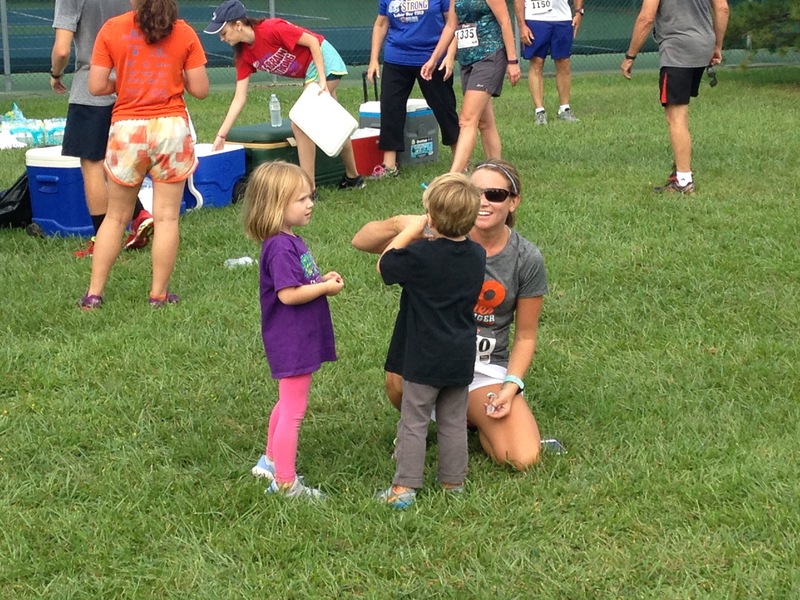 Courtney came in not long after and won 3rd in our age group and the kids even accompanied her to the finish line! After the race we hung around and waited for the award ceremony. The kids loved being there and all playing with one another! Enjoying post race refreshments which included Italian ice! 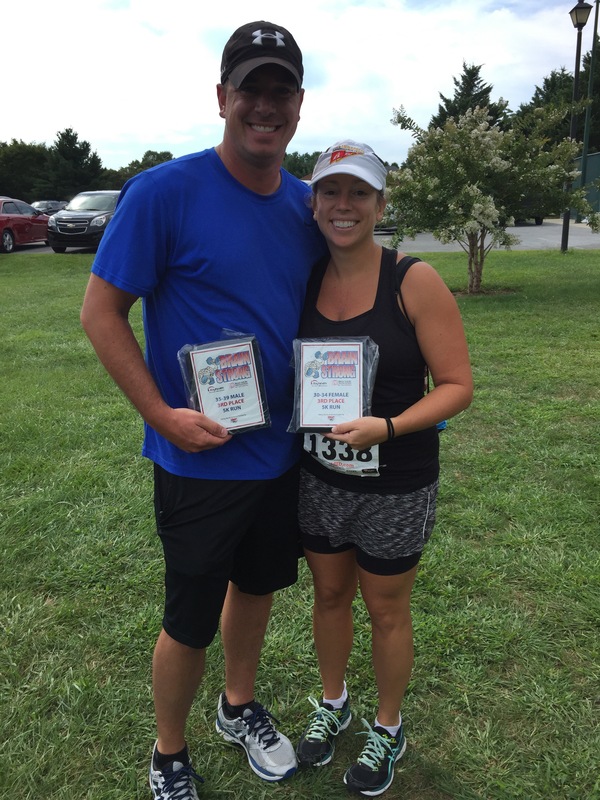 Courtney and Jimmy with their 3rd place age group awards. After the race we enjoyed the pool and soaked up the last few hours of summer! The entire Jones/Stewart crew had a great day filled with fitness and fun! Did you run any races over the long weekend? What is your favorite part of Labor Day Weekend? Awesome job! I love that the kids got to run too! Thank you! 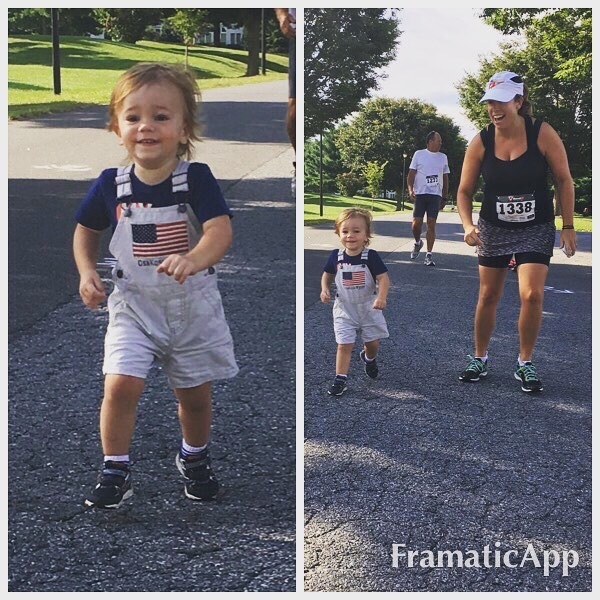 The kid run was cute and I hope they want to do more runs with me as they get older!